So, my Beautiful friends, have you heard about Diwali? Another Indian Hindu Festival which is celebrated all over India and also in some other countries during autumn season. It is the "festival of lights". Click here to know more about it. HAPPY Belated DIWALI to all of you!!! 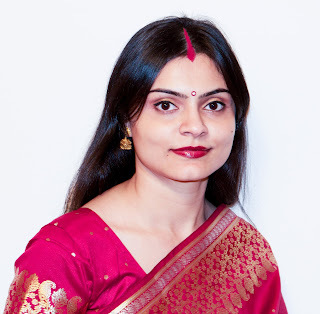 We had a pot-luck party last weekend and I thought why not I use this opportunity to dress up as I would do if I were in India around this time! 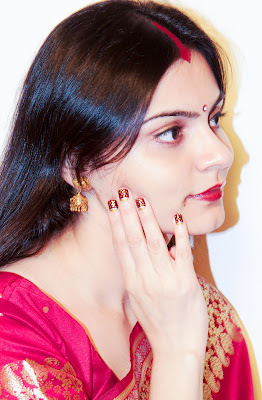 I wore a saree and of course, this easy and quick but beautiful nail-art. I am gonna share here "how to" with all of you guys. 1. Apply base coat (no picture of this step) and let it dry. 2. 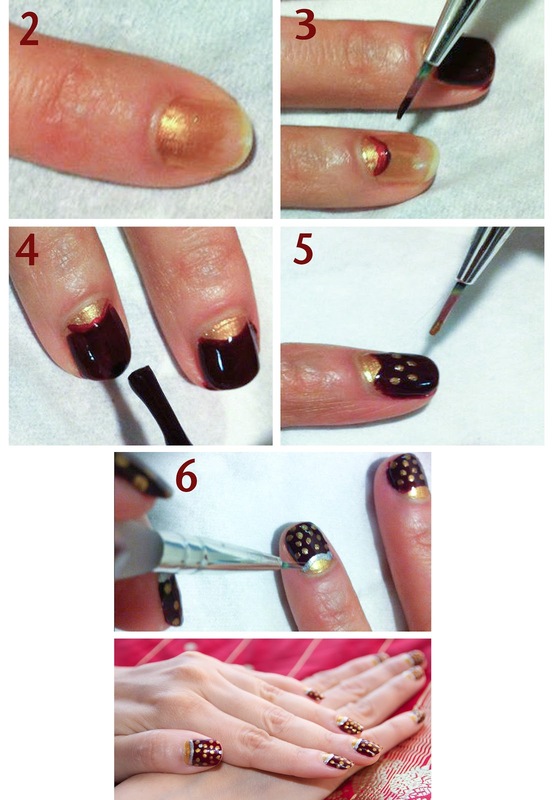 Apply gold color halfway through your nail. 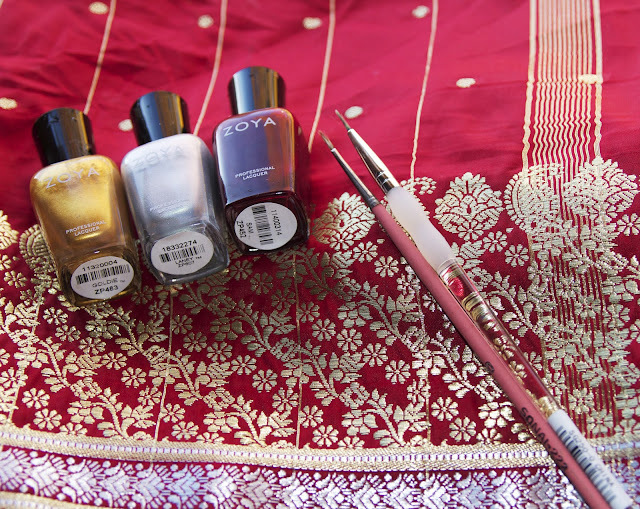 Tip: Apply color with the most pressure at the base of nail-bed; then gradually remove pressure as you go towards tip. 3. Use a very thin brush to draw the crescent. I used #0 synthetic brush from my water color painting brush kit. If you have nail-art brush or any other thin and slim brush, go ahead, use it. 4. Apply maroon color now using the regular nail polish brush all the way to the tip. 5. Use some nail-polish remover to clean that thin and slim brush (you used in step #3) and add gold pokodot using the same brush randomly. 6. Clean the brush again (or use another thin brush) and add the silver lining at the junction of gold and maroon. 7 (optional). Add one or two silver pokodots if you want some more fun. Tip: If you have any imperfection, manage it at the end using the #0 brush. Nobody can notice it. You have it. Believe me, your friends will ask you about how you did it! Because, it looks amazing on nails. Let me know how you like it. Happy trying. Great nails! You must have a lot of patience while doing your nails ;-). I've heard about Diwali, cause my boyfriend has a lot of Indian colleagues. Thanks a lot! You are right, the nail arts need a lot of patience. The secret of my patience is my toddler, it is way easier for me to do my nails than stay calm during her tantrums, lol! Thank you Cathy! I am glad you liked it. Wow, how beautiful! I'm impressed! Thanx Ava for your nice words! this is super cute and you made it seem easy to do. Hello from Grecce!!! :) your nails looks great!! really good work.!! I don't have any talent on nails...!! - sorry for my english- :P we can follow each other ?what do you think? take a look on my blog ;) I hope to like it as i like your blog!! Thank you Nidhi! I am glad that you liked my outfit ideas! Gorgeous manicure! You're so talented!